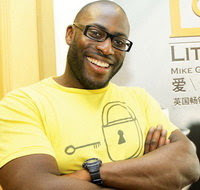 Early in 2007, I discovered the author Mike Gayle. I can't recall how I first got hold of his books, but knowing me, it was during a tired stroll around a book shop, browsing for books that I may be able to read, in small doses, in between sorting the kids out. I flew through 'Mr Commitment' and followed it with 'Dinner for Two' before I had time to catch my breath. By a complete coincidence, which I only realised when I went back to look at the message as I started this post, it was exactly three years ago to this date that I wrote an e-mail to Mike Gayle via his author site. I think that was the first time I had ever searched for an author on the internet and bothered to send an e-mail. I'm one of those people that likes to say thank you when I enjoy something; hotels, customer service, meals, you name it. As far as I was concerned, I sent it off and that was that. Three days later, I had a reply. I was really surprised by that. I've since bought every book that he has written, and if you found me via Twitter you'll know I am currently reading 'The To Do List'. This has been on my shelf since I received my pre-ordered copy. I've only just felt able to start reading it, as if there is one thing I hate, it's finishing a much loved book by an author who does not have another one due out any time soon. I felt ok about reading it now, as there's a new one out in May. I sat in a kids playcentre this morning as, having dipped in already, I just *had* to read some more. Youngest kept himself amused for some of the time at least, and I managed to read a lot more than I would have done at home. Even though 'The To Do List' is a non-fiction book, it is still in the same writing style that I discovered in the novels. I find it very easy to read, as well as honest and down to earth. I love books like that. If I had to write a list of people who have inspired me to write, Mike Gayle would definitely be on it. He has a young family, but manages to write novels and still find the time to respond to people who contact him. Now that is the kind of writer that I aspire to be. 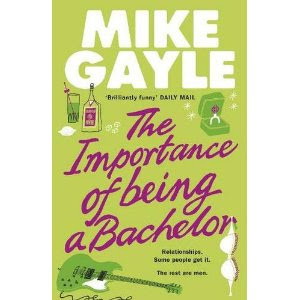 'The Importance of Being A Bachelor' is due for release later this year. Photographs included with permission. Thank you MG! Yesterday, someone actually said to me, "So, have you given up on the writing?" I laughed to myself. I was sitting in the living room with three children who were playing, laughing, and randomly yelling, and I'm meant to be writing at that precise moment? I think not. But the question did fuel my thoughts, and I am sure I am not alone when I say that I have always wanted to write. I always *have* written. From a very young age, poems, stories, and countless letters, during weekends and school holidays, to my friends. Daily outpourings of emotions, feelings and ideas. These memories led to me digging out some of my old poetry. And for your viewing pleasure, I'm going to share my one and only piece of published poetry. 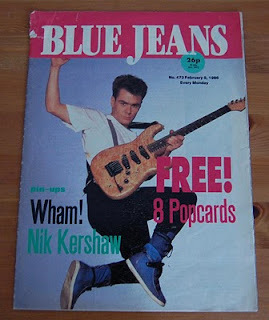 Does anyone else remember "Blue Jeans"? I *loved* that magazine. 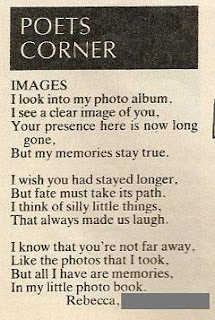 Even more so when it published my poem back in 1986. 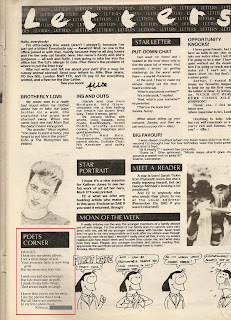 The year that the magazine cost a mere 26p "including VAT", and when contributors to the letters page received a cheque for a whopping £2.00. To my 14 year old self, back then, this felt like a small fortune. But seeing the paper money in my hand was nothing in comparison to the fact that they had printed my poem. A poem that I wrote in a minute or two, fuelled by the agony that was the loss of my maternal Grandad. The only thing that annoyed me was they edited a couple of words. But there you go; as a writer, you have to accept that editing is going to happen. So, as the title suggests, I have a confession to make. After a few story rejections and with a lack of quality time, I haven't been writing much recently. I haven't really felt like it, if I am honest. I have wondered whether to jack it in altogether. A week ago I decided to create my own little controlled experiment. I set up a whole new identity, email, twitter account, blog, the works. I started blogging "in my own voice", writing about random every day things. Within a day this blog had 10 followers and the first post had 10 comments on it. In under a week, the Twitter account had 97 followers. NINETY SEVEN. I couldn't believe it. Anyway I didn't edit my posts on there. I just wrote what I was thinking in a post each day. The blog followers grew to 16 in under a week. The only trouble is, I signed up to it thinking that I would be able to not get attached... but people were so nice. We got talking. I felt like a big fat liar. I knew I couldn't keep it up. What I have learnt is, that perhaps my writing can make people laugh, and be interesting to a wider audience, if I sometimes just write about life itself. In all honesty, it was a thrill to get so many followers for my new persona in so little time. Just now, I made sure I was following everyone who had followed my new account. I then deleted my whole new creation. If you were following me and know which account I am referring to, I am really sorry for feeling the need to do this anonymously. I feel like I have deceived people, and I don't like that feeling. However, as much as I feel guilty for doing this whole "experiment" now, I also feel like I have much more confidence in my writing. I want to thank everyone who follows me and who has read this because it's all of you that made me decide to get everything back in one place. I don't really have enough time to manage more than one "me". Goodbye "mumfulltime" you taught me a lot. I hope that everyone who reads this will be able to forgive me for feeling the need to find my voice. I'm a mum of 3, and a stepmother to 1. I like theatre, cinema, reading and spending time with friends and family.